Contrary to atheists' idea that religion is disappearing and atheism is growing, a new study says otherwise. 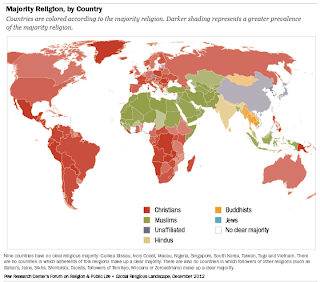 Religion is growing around the globe. One out of three people are Christian! The majority of Christians are Catholics. Over 80% of the global population has some sort of religious affiliation. In other words, religion is the majority. "As of 2012, the world contained about 1.6 billion Muslims, 1 billion Hindus, almost 500 million Buddhists and 14 million Jews, the analysis said.Furthermore, over 400 million people, or six percent of the global population, adhere to folk or religious traditions. Less than one percent – about 58 million people – belong to other religions, including Jainism, Sikhism, Taoism, Zoroastrianism, Wicca and the Baha’i faith." 1 out of 6 are not affiliated with any religion. These can be atheists, agnostics, or people who believe in God but do not participate in any organized religion. Christianity is still on top with over 2 billion followers, most of which are Catholic. Muslims and Hindus follow Christianity as the largest religious bodies. This may hit atheists hard considering they consider religion a delusion. Is it possible that over 80% of humanity is delusional? According to psychology statistics, mental illness always is in the minority, so perhaps three fingers are pointing back at atheists as they point to religious people. Religion is not disappearing: "Ain't no stoppin us now" as McFadden & Whitehead's disco hit says. Actually you accomplished nothing with this article. All you did was prove what was already widely known. Here it can be demonstrated using the same source you cited.